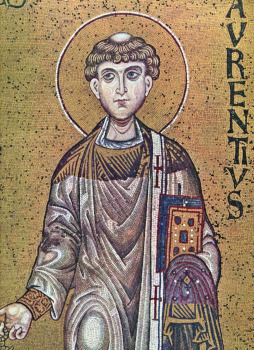 The Martyrs Archdeacon Lawrence, Pope Sixtus, Deacons Felicissimus and Agapitus, the Soldier Romanus, – Romans, suffered in the year 258 under the emperor Valerian. Holy Pope Sixtus, born at Athens, received a fine education, preached in Spain and was made bishop in Rome following the martyr’s death of Holy Pope Stephen (253‑257, Comm. 2 August). These were times when a Pope occupying the Roman throne was known to choose death for the faith. In a short while Saint Sixtus also was arrested and put in prison together with his deacons Felicissimus and Agapitus. When the holy archdeacon Lawrence visited Pope Sixtus, whom they held in prison, he cried out with tears: “Whither art thou gone, father? Why hast thou forsaken thine archdeacon, with whom always thou hast offered the Bloodless Sacrifice? Take thy son with thee, that I may be thy companion in having blood shed for Christ!” Saint Sixtus answered him: “I have not forsaken thee, my son. I am old and go to an easy death, but yet greater sufferings await thee. Know, that after three days upon our death thou shalt follow after me. And now go, take the church treasury and distribute it to the poor and needy Christians.” Saint Lawrence zealously did the bidding of the sainted-hierarch. After this they gave Saint Lawrence over to fierce tortures, urging him to worship idols. The martyr was scourged (with a fine iron flail with sharp needles), they burned his wounds with fire, and struck at him with metal switches. At the time of the martyr’s suffering, the soldier Romanus suddenly cried out: “Saint Lawrence, I behold a bright youth, who standeth about thee healing thy wounds. Beseech thy Lord Christ not to forsake me!” After this they stretched Saint Lawrence on a rack and returned him to prison to Hyppolitus. Romanus brought there a water pot with water and besought the martyr to baptise him. And immediately after the Baptism of the soldier, he was beheaded (+ 9 August). When they took Saint Lawrence to his final torture, Saint Hyppolitus wanted to declare himself a Christian and die together with him, but the confessor said: “Conceal for now thy confession in thy heart. After some length of time I shall summon thee, and thou shalt hear and come unto me. Weep not for me, but rather rejoice, for I go to receive a glorious crown of martyrdom.” They placed him in an iron cage, under which they set an intense fire, and the flames of the bonfire flicked towards the body of the martyr. Saint Lawrence, glancing at the governor, said: “Here now, ye do burn only but one side of my body, turn over the other and do my whole body.” Dying, he uttered: “I thank Thee, Lord Jesus Christ, that Thou hast accounted me worthy to enter into Thy gates,” and with these words he gave up the spirit. Saint Hyppolitus took the body of the martyr by night, he wrapped it in a shroud with ointments and gave it over to the priest Justin. Over the relics of the martyr in the home of the widow Kyriakia they made an all-night vigil and Divine Liturgy. All the Christians present partook of the Holy Mysteries and with honour they buried the body of the holy martyr Archdeacon Lawrence in a cave on 10 August 258. Saint Hyppolitus and other Christians suffered three days after the death of Saint Lawrence (13 August), as he had foretold them of this.